PROJECT SUMMARY: Even 1 story homes can benefit from professional grade landscape lighting. Take this home for instance. Our goal was to illuminate the architecture and the landscape minimizing the total landscape lighting fixture count and make it stand out from their neighbors. We think it has instant curb appeal. Southern Lights Outdoor Lighting & Audio tried to capture and create a soft and welcoming feel for these clients and their guests as they walk up to the front door. Once in the home, looking out for the back deck onto the beautiful lake, the calming sense of this space is amazing as light bounces off the landscape, stucco and stone. We chose to light several trees in the front and backyard. Along wife a few path lights Southern Lights added some tree lights that help mimic “true” moonlight casting light into the natural areas. There is a lot of room for growth on this property. There are lots of areas that could be further illuminated. During the design phase, Southern Lights provided the customer with additional lighting options that could be added onto down the road. The goal with any outdoor lighting design is to capture the essence of the subject, (in this case, the home, landscape, and the backdrop of the lake), for our clients, creating the most ideal landscape lighting effect. 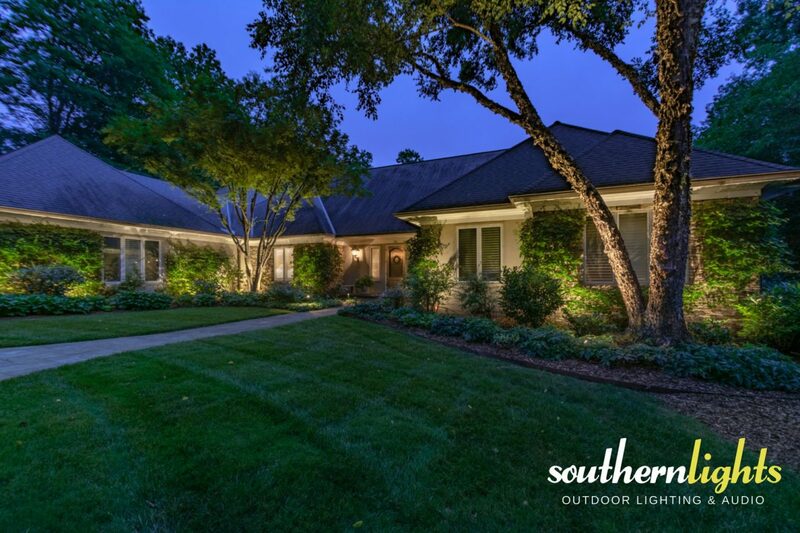 LANDSCAPE LIGHTING FOCUS: Even though the front foundation landscape lighting on stucco and stone is broken up with vines and plant material, Southern Lights was able to add interest to this landscape lighting design. The stucco and stone work really brought out some unique textures. The front entrance of the home and circle drive was important to this client. This homeowner had some older path lights that he wanted to integrate into the lighting design and Southern Lights was obliged to help with the request. When talking with our clients, Southern Lights always tries to listen for what’s most important from our client’s perspective. In this case and in our company motto of (Safety. Security. SERENITY), All three of these focuses played an equal role in these lighting designs.